Gold! Silver! Copper! 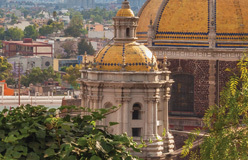 Who could resist the treasures of the Americas? Not the English. Queen Elizabeth I saw what Spain was taking from its colonies, and she wanted the same for England. She encouraged English sea captains to attack and plunder Spanish ships carrying treasures to Spain. England also wanted its own colonies that would send back raw materials, such as lumber. Raw materials are resources that can be turned into finished products and sold for profit. 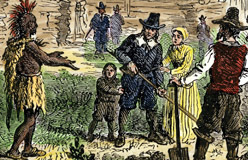 England’s first attempts to establish a colony were failures. 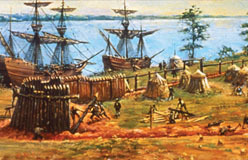 In 1585, about 100 colonists arrived on Roanoke Island in an area that had been named Virginia. 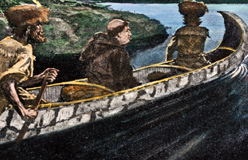 When they ran low on food, all of them sailed back to England. Two years later, John White brought another group to Roanoke. 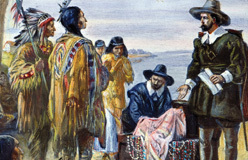 This group also ran low on food, and White returned to England for more supplies, but when he got back the colony was deserted. The only clue he could find was the word “Croatoan” carved into a wooden post. 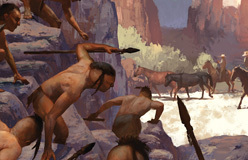 Croatoan was the name of another island and a group of American Indians. 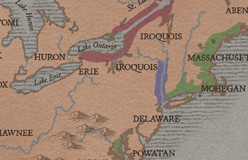 Did the colonists go to the island to live with the Indians? Did Indians attack them? No one knows for sure. 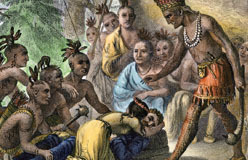 Groups of American Indians had greeted the Roanoke colonists. Some were friendly, and others were not.